We now have a Facebook and YouTube pages to help you on the journey to wood working. And it gives me something useful to do when the shop goes quiet. Here's a link to our YouTube video page. We'll keep adding videos as we get time. Remember always: the best way to get good at something is to do it. "With tools like that, I could build some great stuff." Sure you could. Having the right beginner woodworking tools will take you a long way. But aside from knowing how to exploit their advantages, first we have to get them. And before that, we have to know which ones we should get first. We'd been a hobbyist shop for many years before taking over part of the garage then eventually converting an old storage shed to a shop (odd as it may seem, we like to park our cars in the garage!). Budgetary constraints combined with project complexity to dictated when to acquire the sander, table saw, even the framing hammer we have at West Hills Wood. Now space has become our primary limiting factor. As a beginning woodworker, you may well find that the basic household implements you have on hand are enough to get you started. 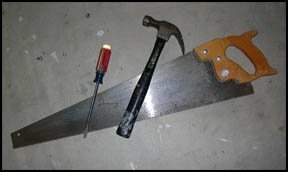 You can make a lot of things with just a hammer, screwdriver, and hand saw. Think bird feeder, house-shaped mailbox, that sort of thing. Projects and tool numbers will grow soon after you've gotten the hang of manipulating wood pieces, thinking in three dimensions, and gained a little confidence momentum. A good growth strategy is to first decide on a project. Then identify which addition would make the production of that project go more efficiently. Yes, you'll use some more than others, but having a drill/screwdriver/saw, etc. at the ready when you need it makes for more pleasant times. Fortunately, all of them will find multiple uses and your proficiency will grow with every use - thus encouraging you to build more projects. One often overlooked woodworking aspect is what to wear. A lot depends on what you are working on. While Norm Abrams is famous for his flannel, we've found that wood chips and particles stick to the material too easily. Same for sweat shirts. When you reach up to dust yourself off, those chips become splinters in your hand. Bad thing that. We prefer the tight cotton weave found in Dickies shirts and pants. We've been wearing their stuff for several years. They look good, fit good, and wear well. We typically wear a t-shirt underneath so standard practice after a day's work is to take off the shirt, shake it vigorously to clear the dust (outdoors of course), then toss it onto the laundry stack. And always wear close-toed shoes.